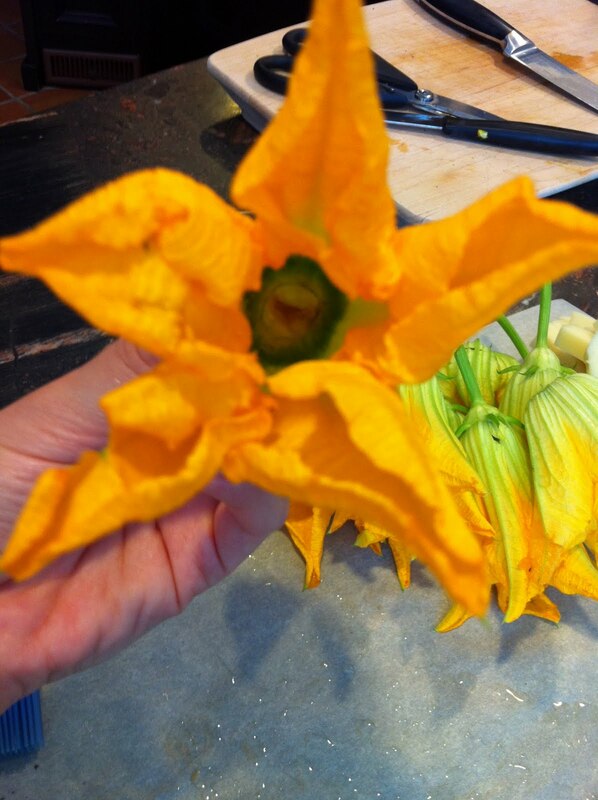 I made the most awesome fried, stuffed zucchini flowers this weekend! 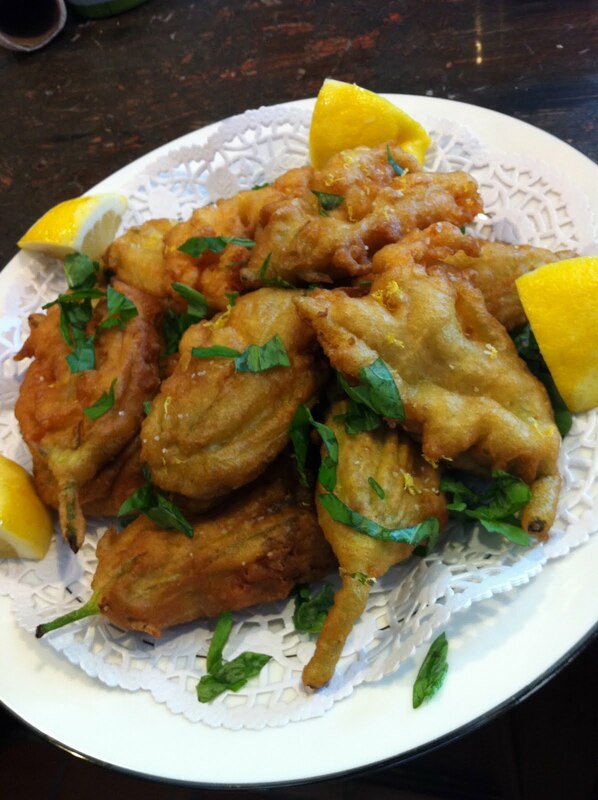 They are most commonly prepared dipped in batter, deep fried and with a sprinkle of salt. That’s how my Grandmother, Nonna Rosina made them.They have a delicate flavour that goes well with just about anything. I’ve even heard of them served as a dessert, sprinkled with sugar instead of salt.Blossoms are prepared in the summer, for the brief and precious time when they are in bloom. Lucky for me, growing up in St-Leonard, we lived in a duplex apartment just upstairs from my grandmother. I remember being so excited to find these, a rare seasonal treat, whenever I stumbled upon them while raiding her fridge. Jaaackpot. 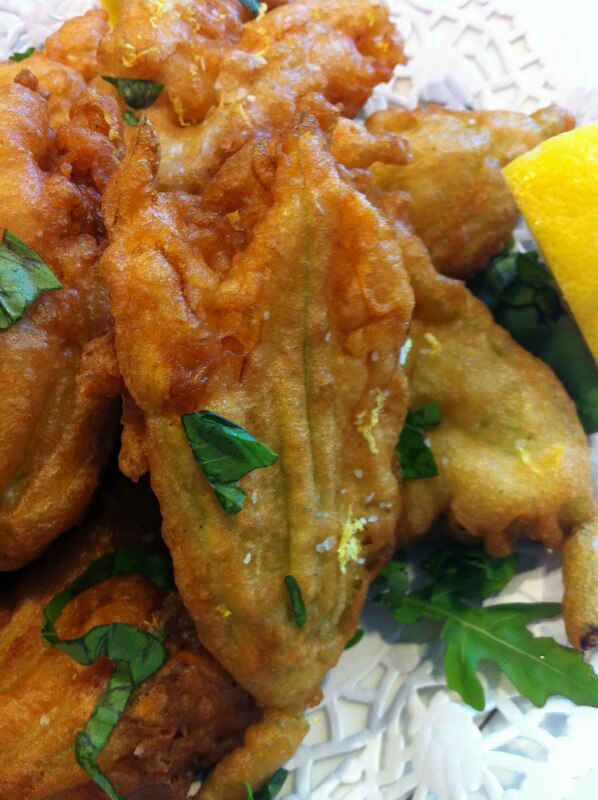 Nonna Rosina simply fried them after having dipped them into a thick batter which puffed up during the frying process.What causes the dough to puff up? Well, her batter had “Magic” in it. You can sometimes find blossoms at a market such as the Marche Jean-Talon also, this is not the obscure treat it used to be. You can find them on restaurant menus everywhere. 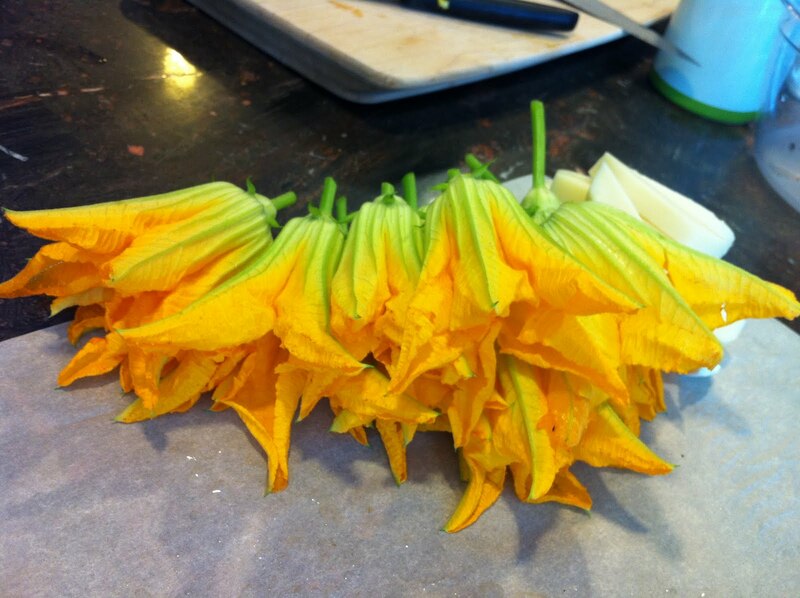 This year I finally planted zucchini in my garden and although I like zucchini, my real motivation was to obtain the flowers…these soon to be, lovely fried blossoms from heaven. They are great plain – no doubt, but I wanted to try something a little different this time. 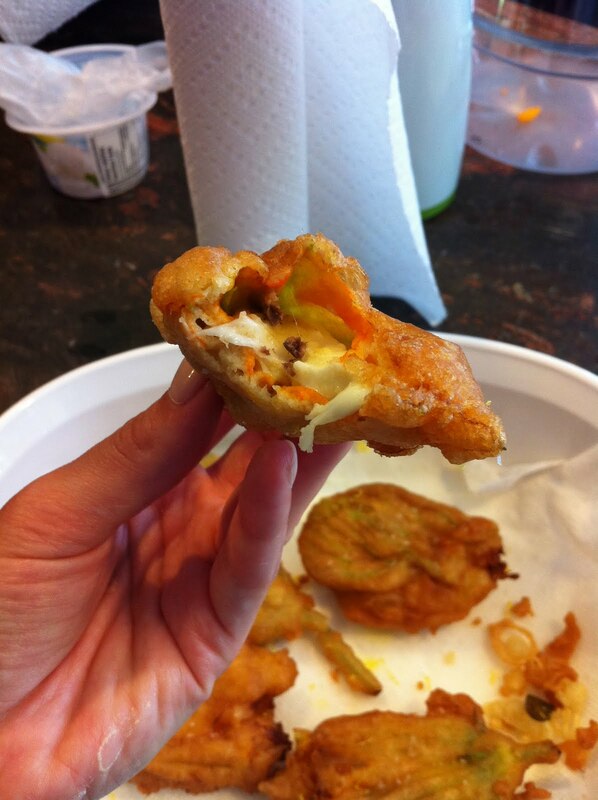 I stuffed them with a piece of mozzarella cheese and a sliver of anchovy filet. DON’T run for the hills people! I know that when you read “anchovy” you nearly shut down your computer right there….You don’t have to use the anchovy but let me explain why I loved this idea before you say no. The salty anchovy with the mild tasting mozzarella compliment each other so well. Then put those in a little fried package sprinkled with lemon and BAM! Picture this – I came in from the sun and the pool, whipped up a batch of these babies and we ate them sitting by the pool. The gooey cheese, the lemon and mild anchovy flavour… Something about it made us feel like we were on a European holiday! You can opt to stuff them with Feta cheese or plain mozzarella. **Note: I use half a filet per flower for a more subtle taste. I cut them in half , lengthwise. With a dry dishtowel or soft pastry brush, gently brush off any dirt on the flower. Do not rinse with water. 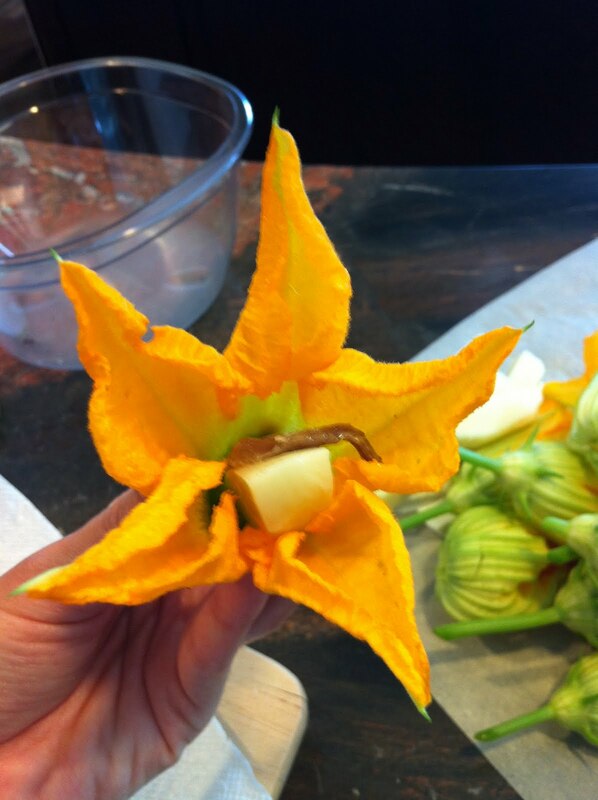 Check inside for any insects and shake them out.Gently reach into the flower without breaking the petals and very gently remove the inner stamen. 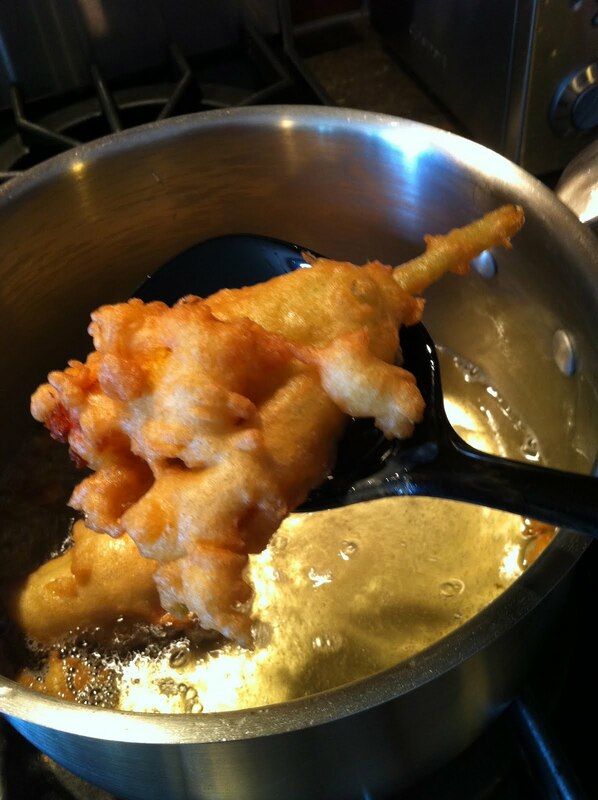 Also, leave at least 2 inches of the outer stem intact to aid in dipping and frying. 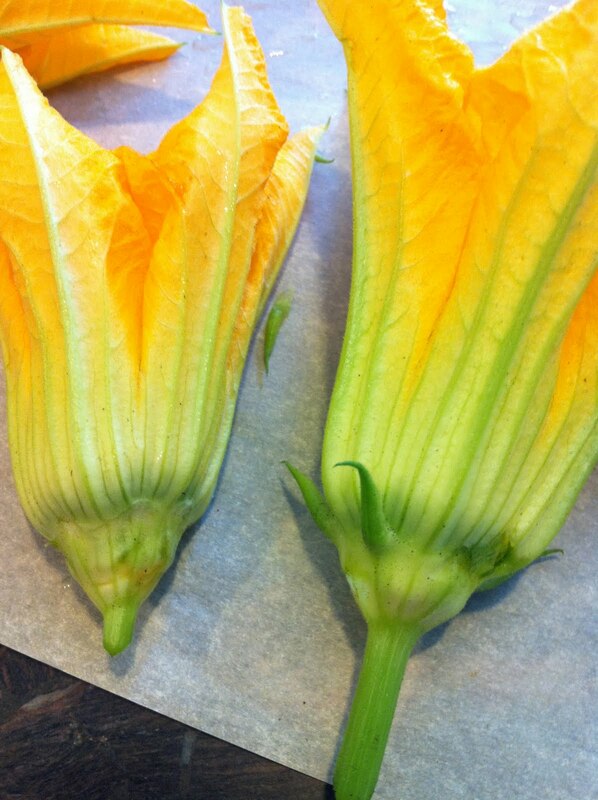 Stuff zucchini flowers with an anchovy filet and a strip of mozzarella. **NOTE: I use a medium sized pot and put about 2 inches of oil. // I used peanut oil this time – worked out well. Stamen removed, gently. Make sure not to hurt the flower 🙂 Its hard to see but there’s no stamen in there. Remove the sharp little things at the base of the flower. Its easy just break them off with your fingers. Sorry, don’t know what they’re called. I found it helpful to coat my stuffed flower using a spoon. 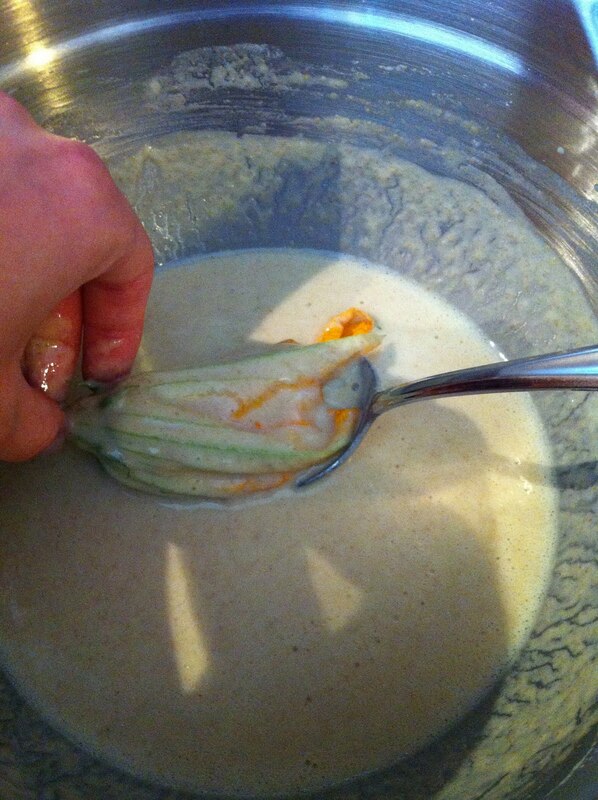 In this pic, I’m turning the flower in the batter by it’s stem, using the spoon as a support so the filling doesn’t fall out into the batter. 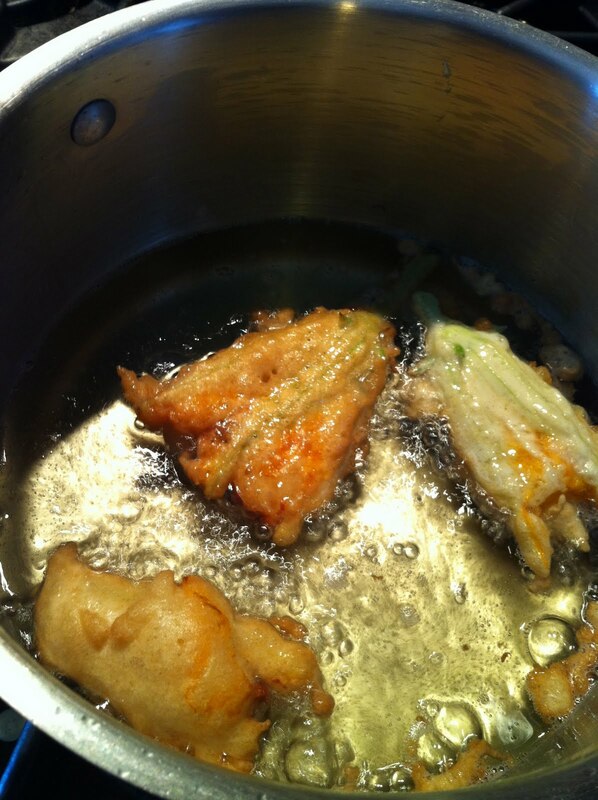 Then, using that same spoon, I lowered the flower into the hot oil. The oil must be hot, so be careful. When frying, if your oil is not hot enough, your food will absorb too much of the oil making it heavy and obviously, too oily. I like using a medium sized pot rather than a frying pan. There is less splatter. The high sides offer a little protection. If using a pot like mine, do not fry more than 3 flowers at a time as to not overcrowd and lower the temperature of the oil. Using a slotted spoon, I removed them from the oil when they were golden in colour and put them onto a paper towel to drain. Yeah, I know…looks amazing, eh? It was! I assure you. Just look at that gooey cheese and the beautiful golden exterior. It was warm, crispy and super tasty! I hope you get to try these soon!